Mickey appears as a large, festive ornament that sparkles as the “Mickey’s Very Merry Christmas Party” sign beckons you to enter through the Main Street Train Station tunnel. Join Mickey, Minnie, Pluto, Goofy, Donald and the Fairy Godmother as they help Cinderella bring her holiday wish to life. The dark castle soon resembles Cinderella’s glass slipper, sparkling and twinkling it’s way to a breathtaking conclusion! 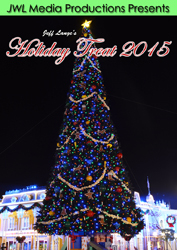 You’ll enjoy perfect viewing of this new holiday tradition from Christmas Tree Point on Main Street USA! Snowflakes gently fall as you watch treasured characters including Mickey and Minnie, Snow White and the Seven Dwarfs, Cinderella, and new for 2009 – Princess Tiana and Prince Naveen! Returning favorites include the gingerbread men, toy soldiers, prancing reindeer, ice skaters and Santa Claus! This fireworks spectacular lights up the sky over the Magic Kingdom and Cinderella Castle. The show is a combination of six “acts”: The Spirit of the Season, The Spirit of Holiday Wonder, The Spirit of Sharing Hearth and Family, The Spirit of Holiday Childhood Fantasies, The Holiday Spirit in Each of Us, and Christmas All Around Us! Mickey and Minnie join their friends at the castle forecourt stage to celebrate the holiday season in a dazzling spectacle that ends with a bang! Donald, Chip and Dale, Pluto and Goofy interact with a lively cast of performers in a “joyous celebration” that features Minnie receiving her Christmas gift from Mickey. This holiday extravaganza is not to be missed! Your evening concludes with a midnight stroll down Main Street USA, taking in the windows adorned with Christmas displays and the festive garland hanging above you. Toy Soldiers meet you at the hub for picture-taking opportunities. 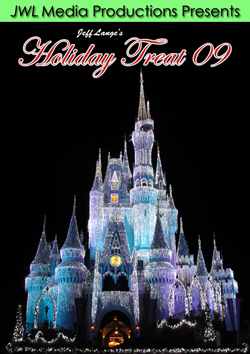 Pick up a copy of “Jeff Lange’s Holiday Treat 09” today and relive all the magic or experience it for the first time.